Today we're going to go through a step-by-step process for designing an NPC! There are many ways you can go about creating an NPC. When I need to come up with a cool NPC, I head to the internet to find a cool picture to use for inspiration. What are your first impressions of this person when you see this picture? I think this person is a fighter. Based on his unique armor, he probably has a nickname. His helmet looks like it has a horn, so let's call him The Rhino. Well, if we call him the Rhino, we need to give him a charge ability, don't we? Let's add a charge. To look at how charge works, look in the Monster Manual for monsters that already have it. Here's what we'll use. Charge. 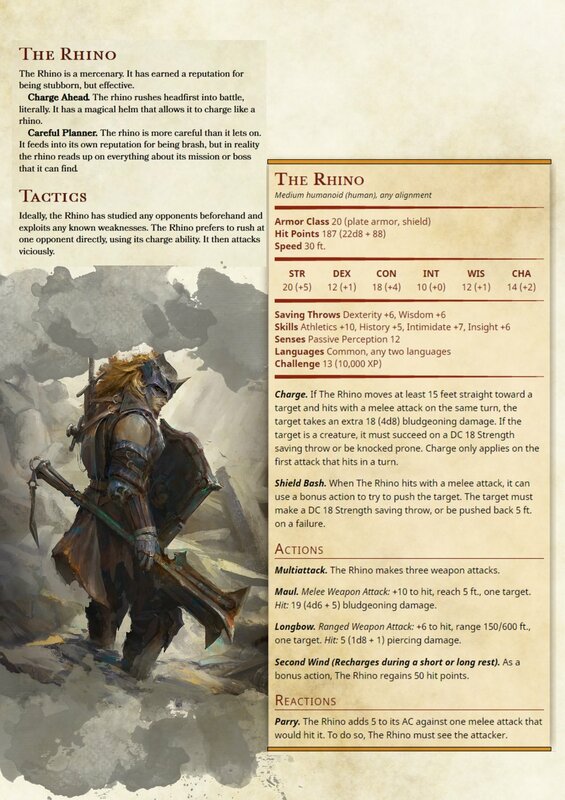 If the Rhino moves at least 15 feet straight toward a target and hits with a melee attack on the same turn, the target takes an extra 18 (4d8) bludgeoning damage. If the target is a creature, it must succeed on a DC 18 Strength saving throw or be knocked prone. Charge only applies on the first attack that hits in a turn. Most of this was taken directly from an existing monster, all that changed was the distance required to move and the damage/DC. What other abilities can we give The Rhino? He's got a big shield, let's use that. A number of NPCs in the Monster Manual have "Parry", let's use that. (Parry appears to add a creature's proficiency to their AC as a reaction). The Rhino looks like an aggressive person. 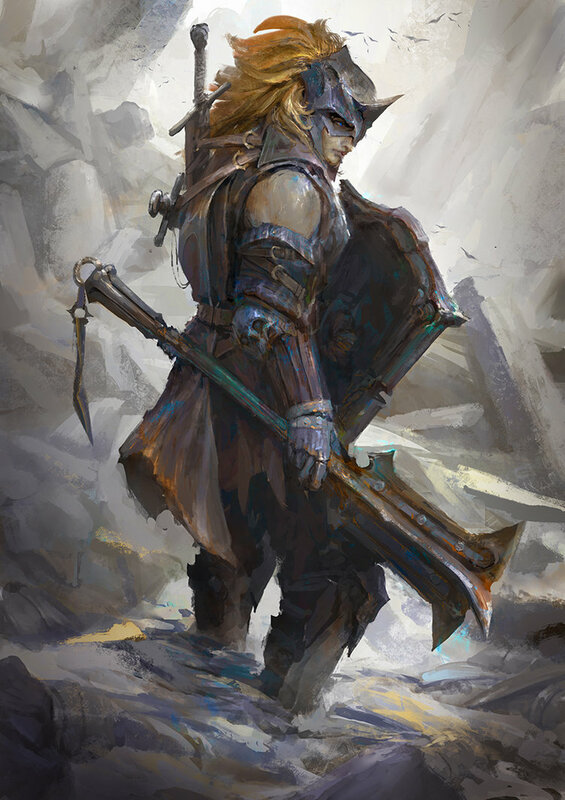 I want him to be able to use the shield offensively, so let's give him a Shield Bash ability. I could make it just a simple damaging ability, but I want to try something different. Let's have the shield bash just move the target if they fail on a saving throw. This won't change the Rhino's Challenge Rating (CR) at all, so we can add it without worry. Shield Bash. When The Rhino hits with a melee attack, it can use a bonus action to try to push the target. The target must make a DC 18 Strength saving throw, or be pushed back 5 feet on a failure. Let's move onto some of the more numerical aspects, the statistics. The Rhino looks incredibly strong. The highest level a human can normally achieve on Strength is a 20, so let's use that. He doesn't look very agile, so I wouldn't put his Dexterity high. He's a skilled fighter, so let's do just slightly above average, 12. Constitution looks like it would be high as well, so let's make it an 18. I could see making it a 20 as well. I see the Rhino as surprisingly insightful instead of having book smarts, so I'll give him a higher Wisdom instead of Intelligence. We don't need to make him dumb though, so I'll give him average Intelligence of 10. Finally we come to Charisma. I mean, that's a pretty looking dude, but Charisma isn't just appearance. I'm starting to get an idea in my mind of The Rhino, seeing him as a leader. Let's give him a 14 on Charisma. It's not super high, but it's certainly above average, making him an effective leader. Before we go any further, let's talk about where we stand with The Rhino. He's shaping up as a physically strong warrior, who also leads. To get a nickname like The Rhino, I'm thinking that he has to be a mercenary. They get cool names, right? Anyway, The Rhino is a leader of a mercenary group, we can figure out who later. With this new information in mind, let's do saving throws quickly. We can add two saving throws without affecting the CR. A good idea is to look at the weakest stats and apply the saving throws there if you want to reduce the character's weaknesses. I want the Rhino to be an all around good fighter, so I'll amplify his weakest saves, Dexterity and Wisdom. The Rhino's skills can come naturally from the vision we have. Athletics is obvious, due to his physique, as well as Intimidate. I see him as surprisingly insightful, so let's go with Insight. Finally, even though he's not smart, he's a tactical leader. I think he's well read with historical battles and tactics, so let's give him History as well. Armor. Looks like he's got heavy armor, so let's call it plate. He's got a shield, so add those together for a total of AC 20. The hardest party is figuring out hit points and attacks. For beginners, I would suggest looking at the hit die and number of attacks of a similar creature to the one you want to make. For the Rhino, I see him as a big, beefy tank. He has a large AC, so let's give him a large pool of hit points as well. For his attacks, three is a good number for a melee fighter. He's not getting damage from anything else except his charge, so he needs multiple attacks to keep his damage up. One thing I did was increase the damage he deals with melee weapons. A maul would usually deal 2d6 damage, but I doubled it to 4d6 to make him a bigger threat. Finally, we calculate his Offensive CR and Defensive CR, and then find the average. By doing the math, we come out at a pretty big CR 13. Playtesting is important in figuring out the real CR a monster/NPC should be, but this is a good guideline to use. That's it! We've made an NPC. 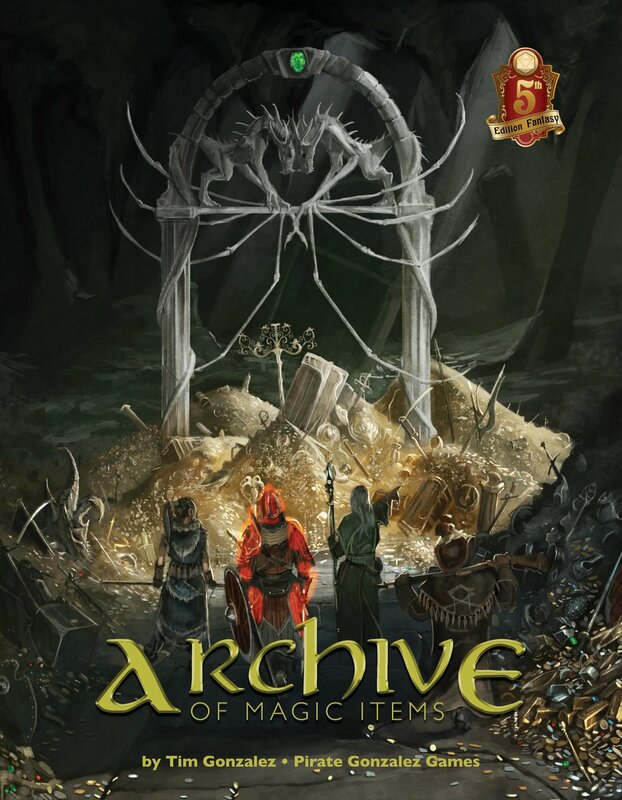 This is what our final version looks like. That's the very quick, very brief run-through of designing and creating an NPC. I hope this was helpful, and stay tuned for more in the future. I'm adding an NPC gallery in the Homebrew section where the Rhino and other NPCs will live. Do you have an NPC you want to stat out? Hit me up on twitter @pirategonzalez and let me know what you have!